I am quite excited about going to "Tea in a Secret Garden" next week (see previous post), so I was particularly delighted when I made a check of the Library of Congress website to look for new-to-me tea images and spotted this one. 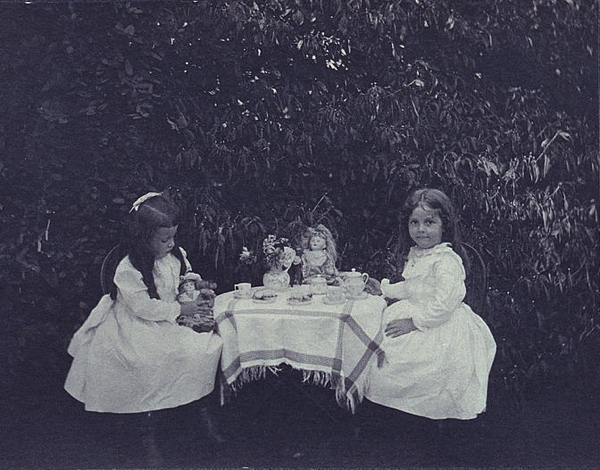 According to the entry at loc.gov, "Photograph shows two girls having a tea party with their dolls in a garden." The photograph was published circa 1900, and neither the subjects nor the the photographer are identified. Isn't that a charming photo? I like to use random photos as writing class prompts, so I think I'll share this with my star pupil next week and see what she comes up with! Live nearby? 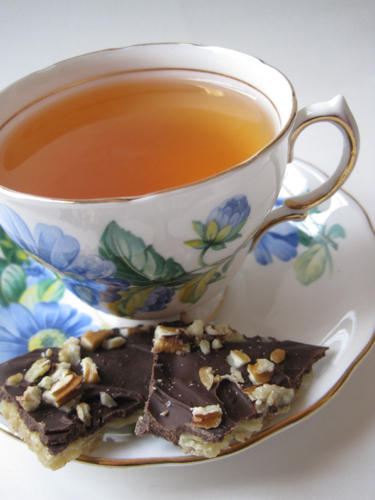 Come to 'Tea in a Secret Garden' on April 8! 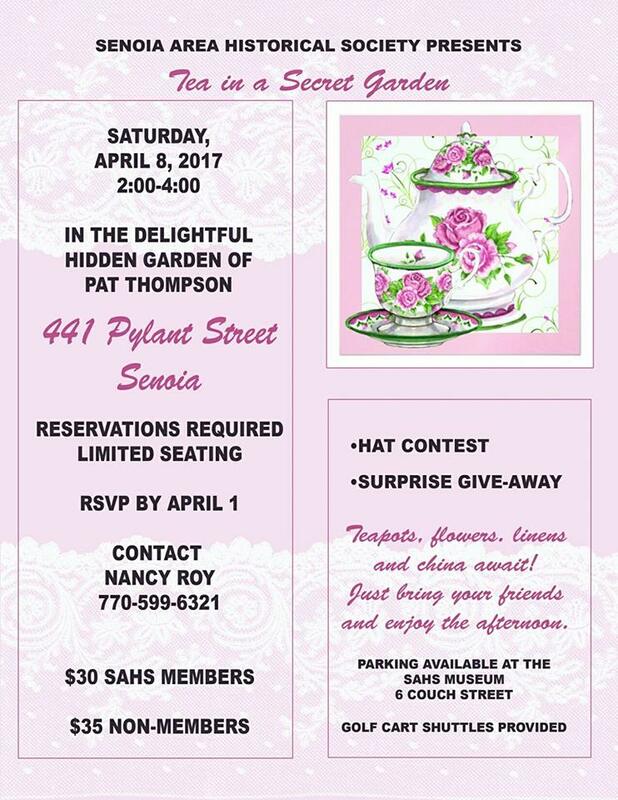 For those of you who live locally, it dawned on me that I should let you know about one of the best opportunities to enjoy tea in this area, the Senoia Area Historical Society’s “Tea in a Secret Garden” coming up on April 8! 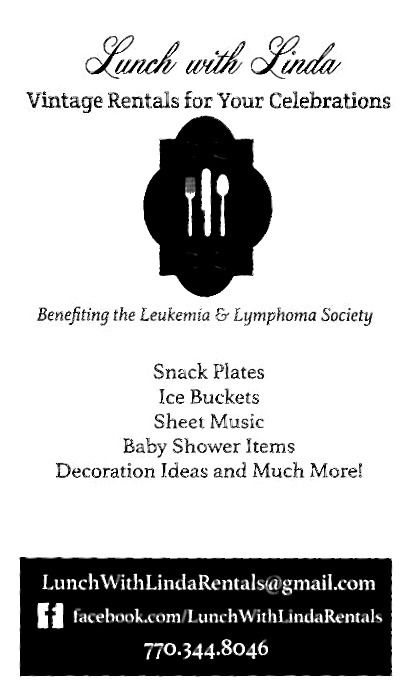 This flyer has all the info, and you need to RSVP by Saturday. 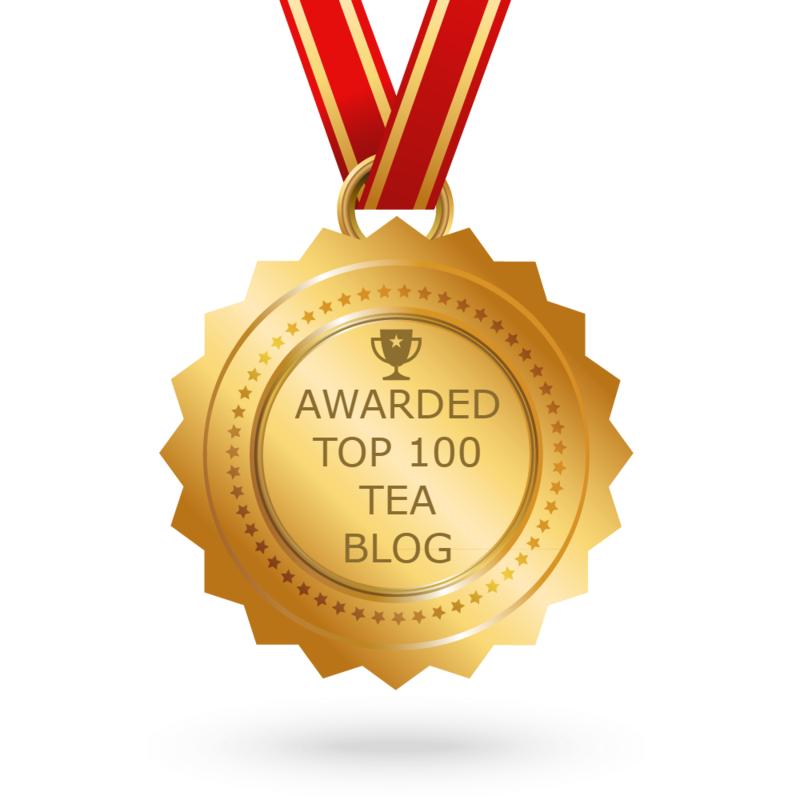 I’ll be there as one of the judges for the tea's ever-popular hat contest, and I can’t wait! Their last big tea event was this one, and here are scenes from another one of their lovely teas I attended as well. 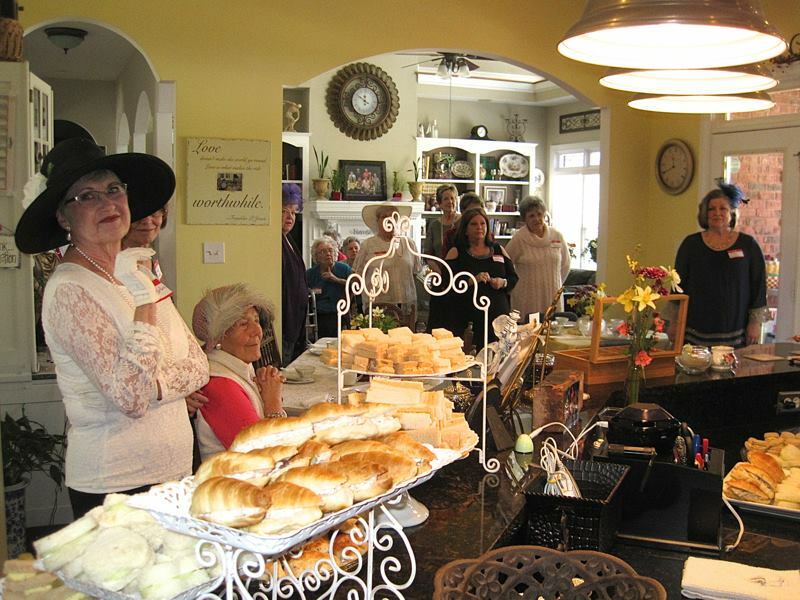 This group always takes great care of their guests, and the food and tea are absolutely delicious! So if you happen to live within driving distance of Senoia, I know they—and I—would love to see you there! 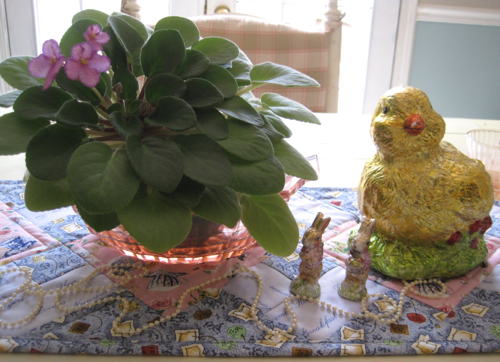 An inspired new Easter decor! 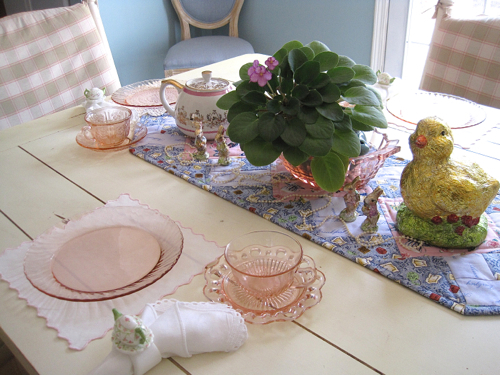 Last week I was inspired to do some early Easter decorating thanks to an incredibly thoughtful gift from a blog reader in Iowa, Nancy! 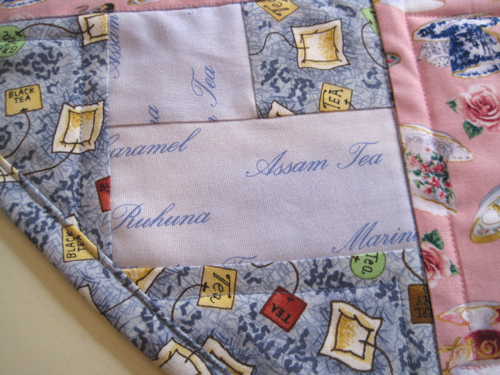 She mailed me this beautiful tea-themed table runner she'd made! 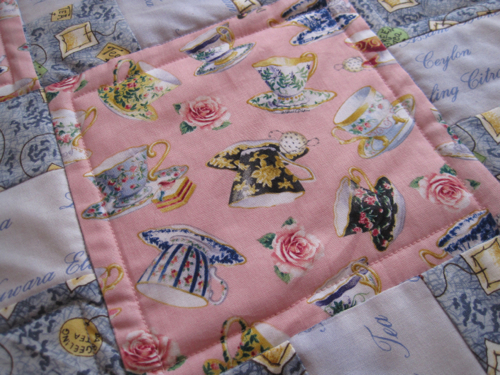 And one with tea bags and tea tags! How charming! Inspired by Nancy's lovely gift, I pulled out some pink and pastel pieces and started experimenting. I found these tiny little bunnies at Tuesday Morning last year. 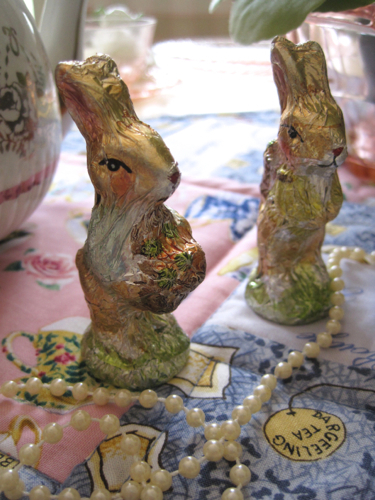 I love the look of foil-wrapped chocolate Easter bunnies, and since these are purely for decor, I am not tempted to eat them! 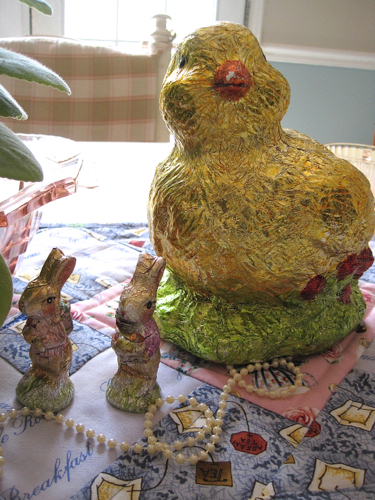 The giant Easter chick was a T.J. Maxx find a few years back, I believe. 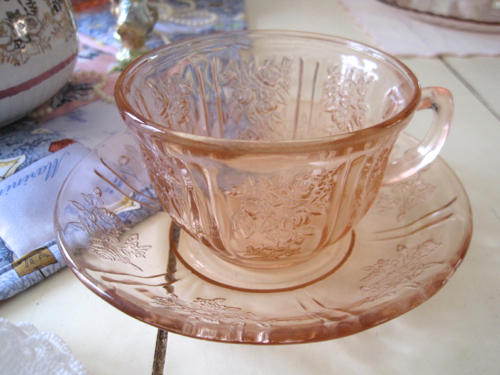 I have only one, and I definitely don't need to collect one more thing at this point in life, but this Sharon or Cabbage Rose design glass teacup is certainly pretty! So I'm quite pleased with the new decor that Nancy has inspired, and if any of you would like to drop by for a cup of tea, the table's ready! 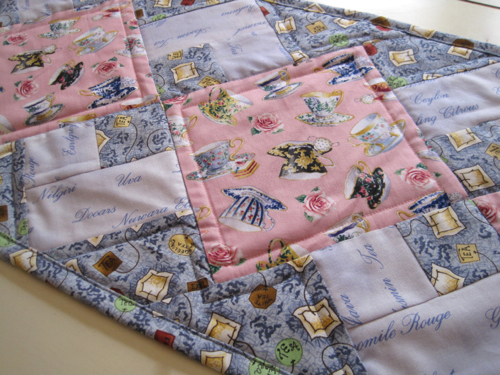 Nancy Reppert of the Rosemary's Sampler blog! 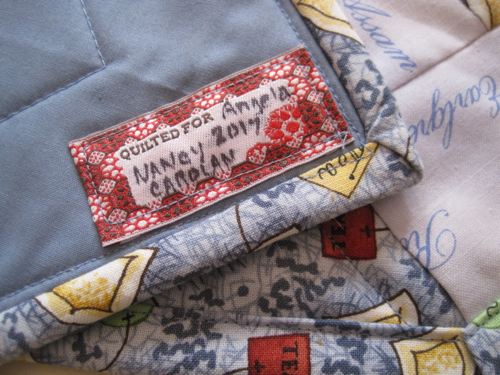 Congrats, Nancy, and I'll have these on their way to you shortly! 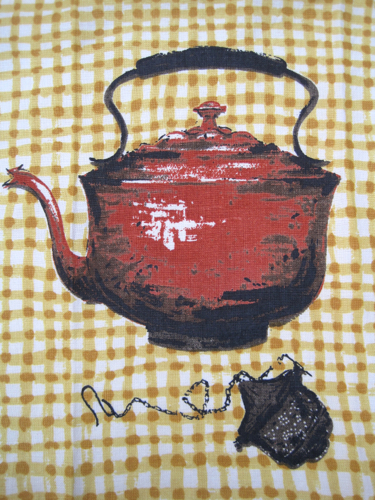 A thoughtful friend recently gave me a vintage tea towel she bought for me since she knows I like old linens and teatime. 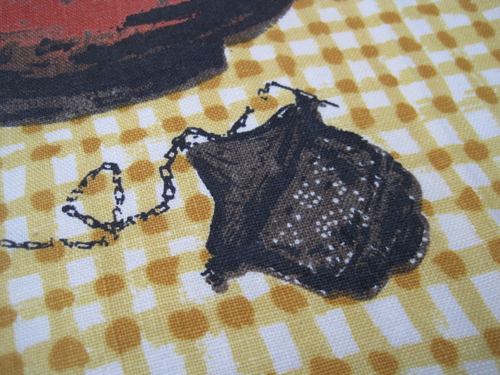 The towel is in great shape, and I'd never seen one like this before with both a teakettle and a tea infuser. I've actually owned a few infusers just like this one, and the graphic is spot-on! 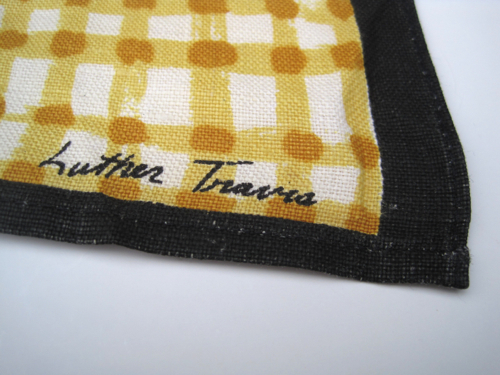 The designer, Luther Travis, is a name that was new to me, but I did a little research and found that Luther was designing back in the sixties. 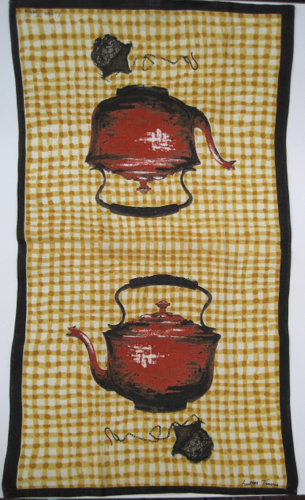 These colors remind me very much of the Early American decor my family had when I was a little girl, which would have been the late sixties, so it's fun to have a "new" tea towel that's almost as old as I am! 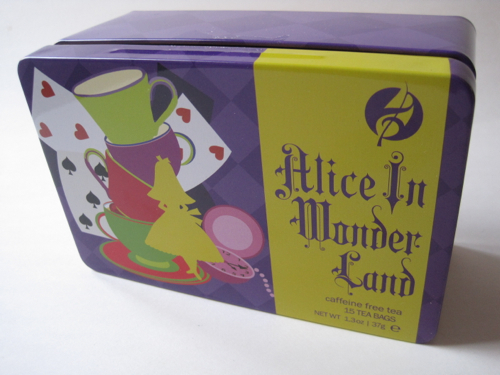 Last week I got to meet with a friend I haven't seen since Christmas, and she gave me several belated (and much appreciated) Christmas gifts, including this cute tin of Alice in Wonderland Tea from Adagio! 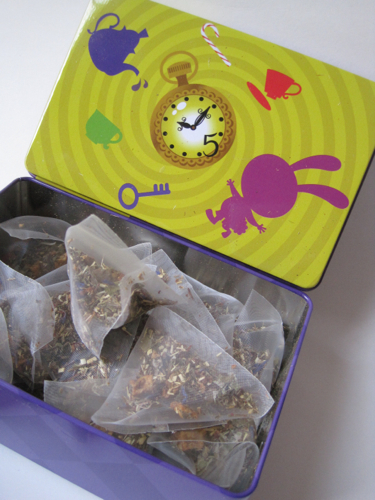 I'd not heard of this herbal blend, but I loved the scent and sight that greeted me when I opened the tin! 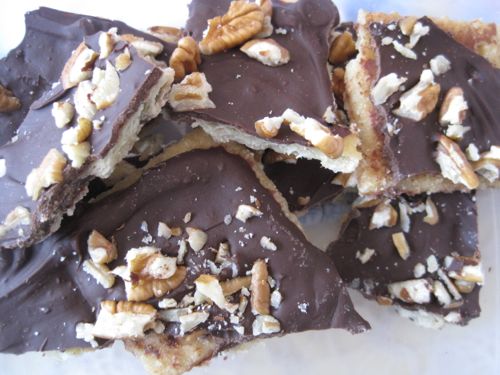 I had some to accompany my afternoon snack of what is just about my favorite sweet in the world, that super easy toffee you make with saltines! I assume all of you have made this about a million times, but here's the recipe just in case someone has not. 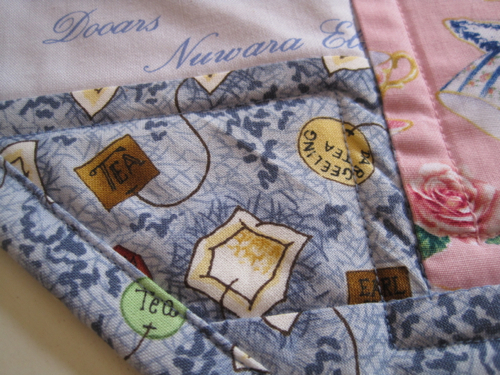 Want to win some cute tea towels? 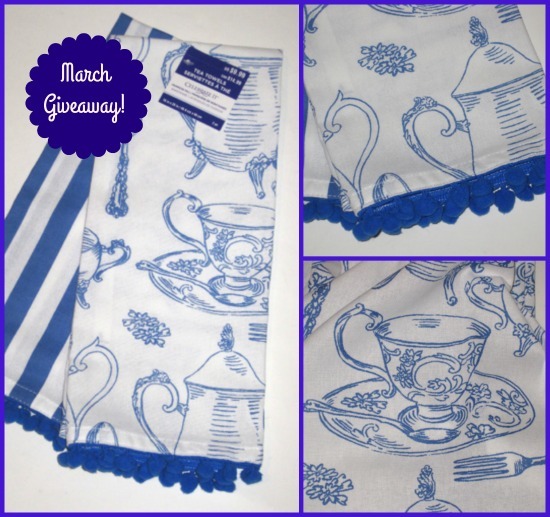 I was about to run out of hope of finding something cute to offer for a March giveaway, but then Frances in California thoughtfully notified me that she'd discovered Michaels has the Primrose collection of tea motif goodies on sale, so I picked up a pair of these cute tea towels for this month's giveaway! If you're a fan of blue and white, then you'll definitely need a pair of these tea towels, so some of you may want to go ahead and stop by Michaels this week to get some of these bargains while they're still available. Or you can wait and see if you win these! To be entered, just leave an "Enter me" to this post between now and 7 a.m. EST Friday, March 24, and you'll be entered to win. (US and Canada only, please.) Good luck! 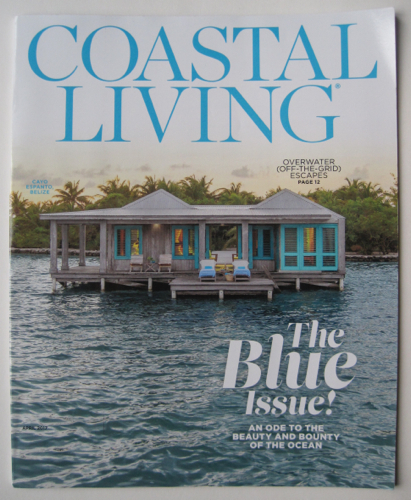 I've been quite pleased with my magazine selections this month and wanted to tell you about the tea finds in a few of them! 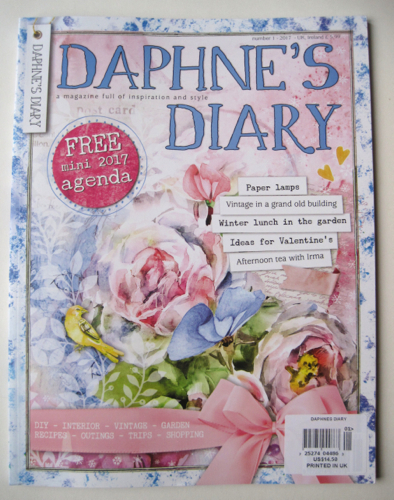 Daphne's Diary has been a favorite for a few years now, and I think this cover is one of the prettiest ones they've ever had. I've yet to find an issue that didn't feature tea in one form or another. 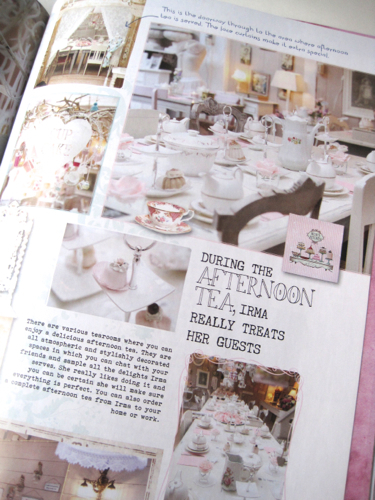 And this time, there's a feature on the most "Shabby Chic" looking tea room (in the Netherlands, alas) that I've ever seen. It is gorgeous! 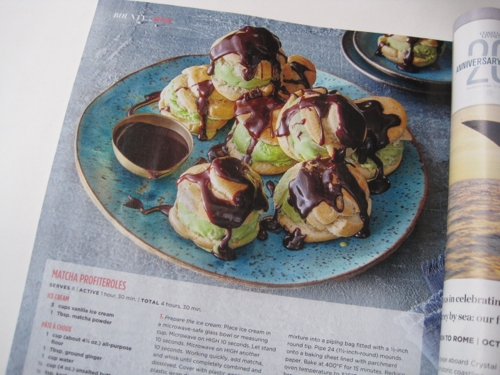 A recipe for Matcha Profiteroles! I can't wait to try these. 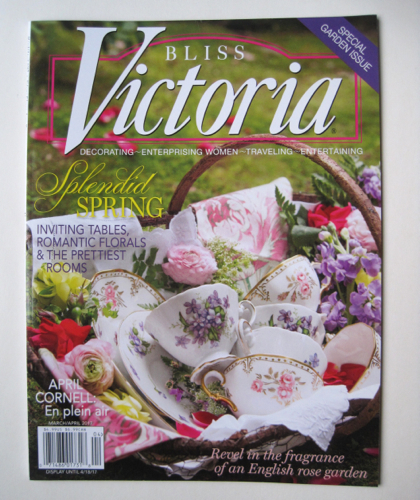 The new issue of Victoria has an absolutely beautiful cover! This whole issue, in fact, reminds me very much of those early issues of Victoria. 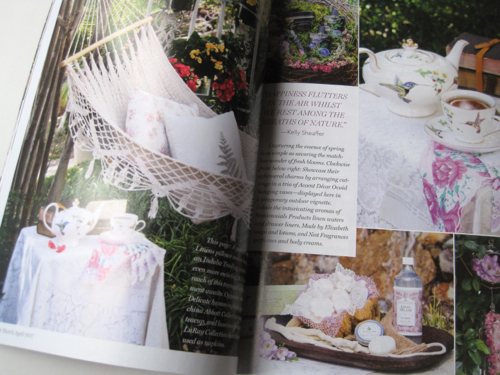 Even the inside spread has that gauzy, dreamy look—and lots of tea! 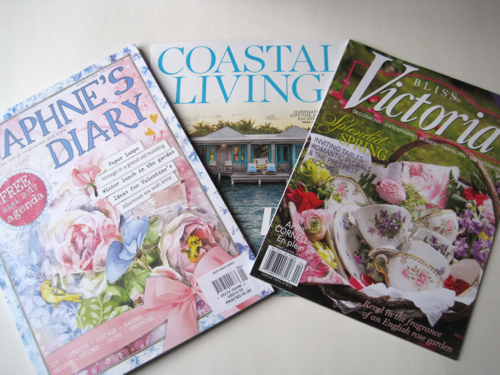 Besides Tea Time, obviously, have you found any fun tea-ish magazines, or magazine articles, lately? Before I put away all those snack sets from the ladies' group tea last week, I made a point of organizing them into two hampers with like pieces grouped together. What struck me, though, was how very many variations there are on this apparently common moss rose design. Do some of you remember the old song from "Sesame Street" that began "One of these things is not like the other"? 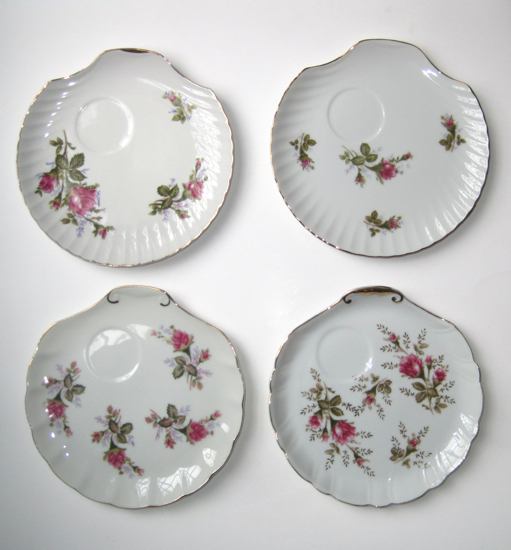 Well, all four of these plates are not like the other! 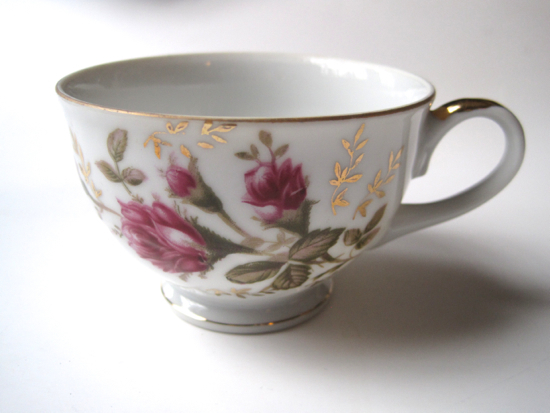 The cups, too, had different shapes, handles, and roses. The two at right both have scallops, although it's a bit hard to tell on the cup at lower right. My favorite of the designs is this one. Those thin "mossy green" leaves are really gold, and if you look at the leaves at far left, you'll see what I mean. I just wasn't able to capture the gilding in my photo. You can see it a bit more in the teacup. I have six of these sets and really love them. Just wish I could remember how and why I acquired them! 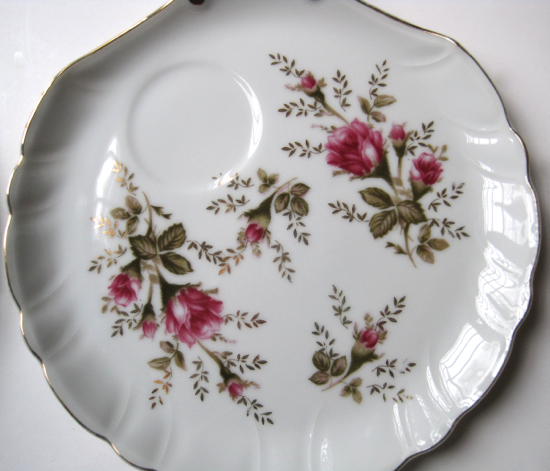 On the other plates, I found myself studying the number and placement of roses and the lavender flowers among the leaves. 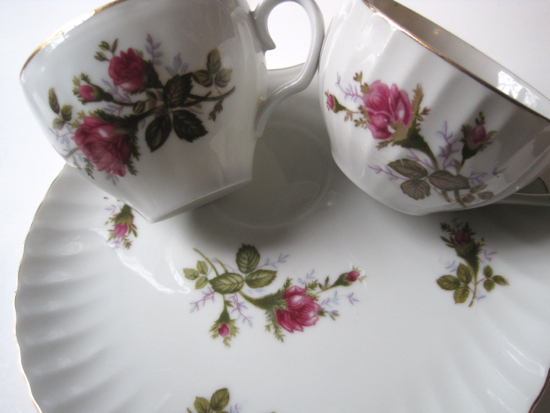 Clearly, the cups matching these sets would be the ones with the lavender flowers, right? 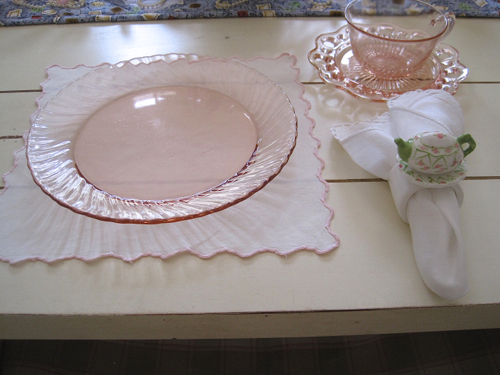 But which of these two cups would you pair with this plate? 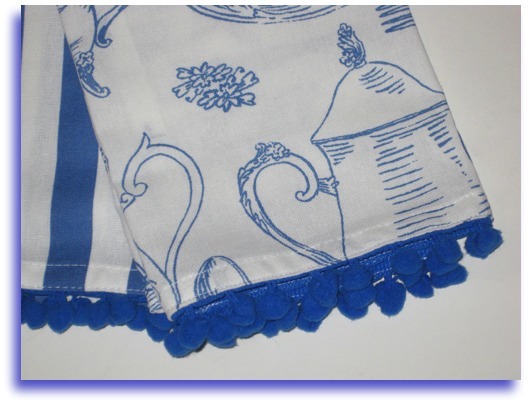 The one on the right, I suppose, since it has more of a scalloped design. I finally realized that if I'm pairing cups with snack plates and can't see much difference in a particular design, my guests won't be too bothered by any mismatched sets, either. Since many of these plates have a number but no back stamp on them, I've decided that absolutely accurate identification of them is simply not going to be a priority. 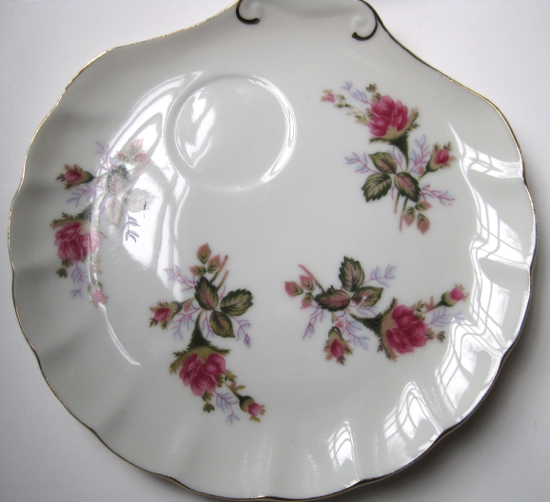 Do you have any pieces that have you scratching your head over which cup goes with which plate or saucer? All I know is that I have 17 of these rose snack sets where I'm positive of the pairing, and 15 are anybody's guess! It's always fun to hear from different tea companies, not only because I like the idea of trying new-to-me teas but also because I continue to be impressed by all the amazing tea companies in our wide, wide world of tea! 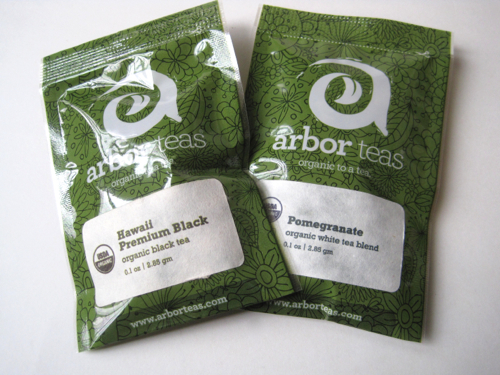 When I was contacted by Arbor Teas about trying some of their teas, I was eager for them to arrive so I could sample them and learn more about this company. 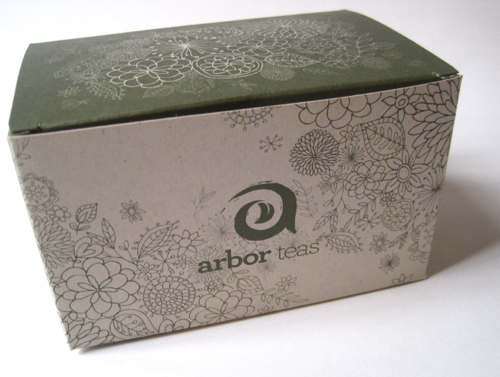 Arbor Teas, I learned, offers only organic teas, and their company is focused on "sustainability and doing the best we can to protect the planet while also offering the best teas we can get our hands on!" Sounds like a great focus to me! They sent a box of four teas, and the two I sampled this weekend were the Hawaii Premium Black, an organic black tea, and Pomegranate, an organic white tea blend. 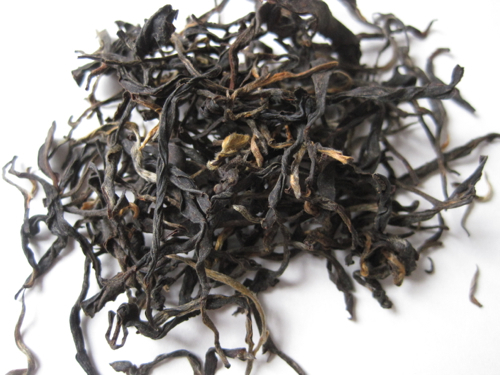 I knew I would like the Hawaii Premium Black as soon as I opened the packet and inhaled that fresh, woody scent, and I was also intrigued by the long (often more than one-inch-long) wiry tea leaves. I've been sipping lots of flavored teas (particularly Earl Greys) lately, so to taste a plain black tea was actually a treat, and this one had a sophisticated, smooth, and almost sweet taste I greatly enjoyed. I often marvel that an unflavored tea can have such personality, but this one did. Maybe I also loved that it is a USA-grown tea as well! 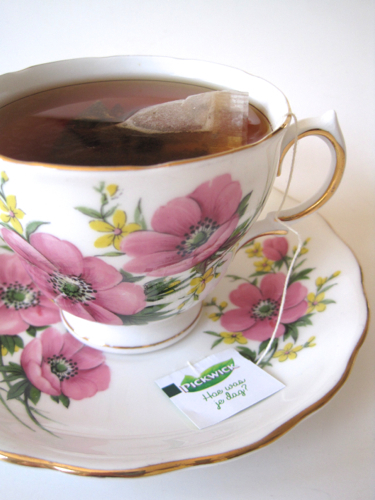 I so enjoyed the sophisticated black tea taste, with very little astringency, and I enjoyed multiple cups! Next I tried the Pomegranate white tea, and again, I was impressed at first whiff. 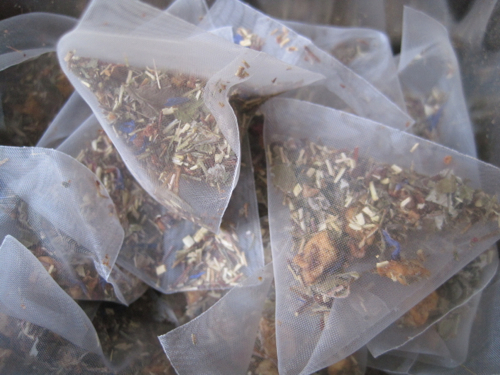 This blend consists of organic Indian white tea, organic rosehips, organic safflowers, and natural pomegranate flavor. 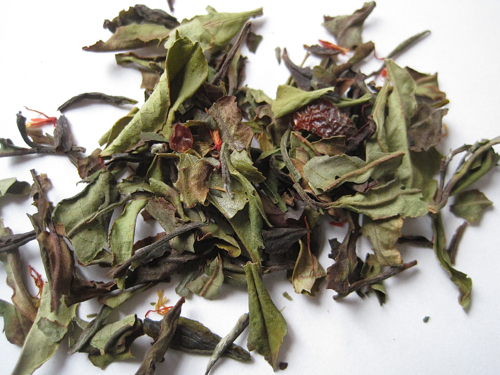 I loved the fruity scent, and when I prepared the tea, I was impressed with the light fruity taste. Some pomegranate teas can be mouth-puckeringly tart, but this one was not, just a tea with a subtle, fruity taste. So far I'm quite impressed with these new Arbor Teas, and if you'd like to check out this company for yourself, click here. 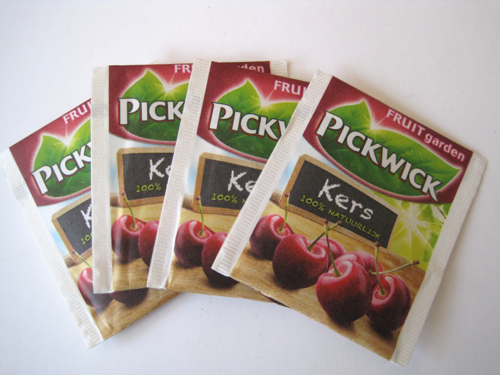 Tea friend Donna recently shared a new Dutch tea with me, Pickwick's Fruit Garden blend, and I decided to enjoy it in one of those 20 (!) 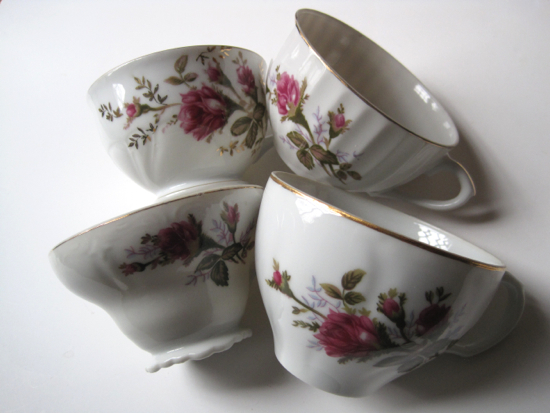 new teacups I recently received. This pink and yellow one looks like spring to me. The tea was just delicious and did indeed have a lovely, light cherry scent and taste. 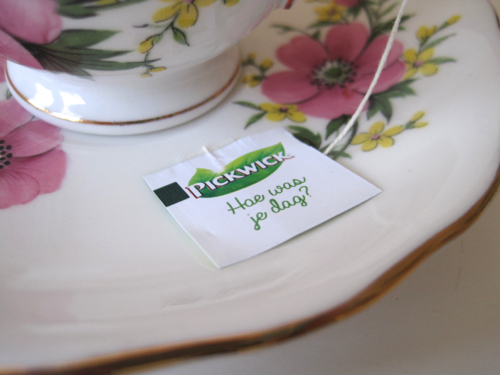 I was also curious about the sayings on the tea bag tags, and "Hae was je dag?" sure looks like "How was your day?" and Google Translate tells me that yes, this is so. My day was just fine, and it was made even better by the sampling of some tasty Dutch tea! 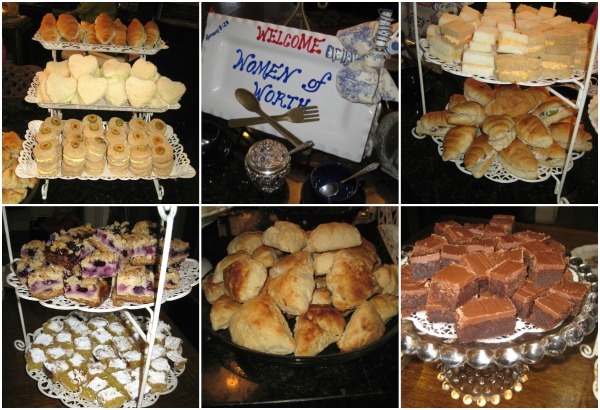 Teatime with the Women of Worth! My friend Susie has started a unique ministry. 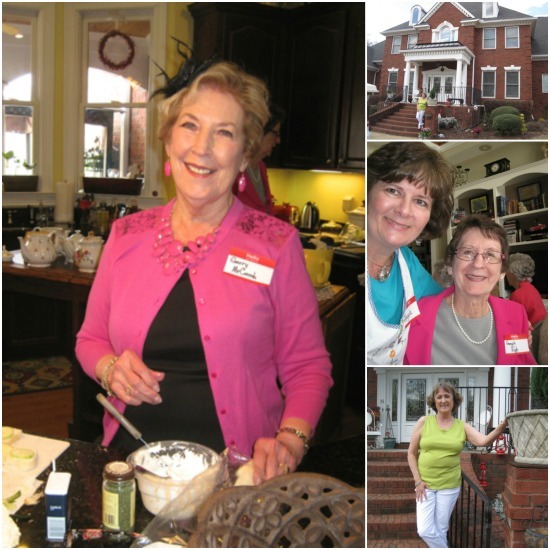 Her dear husband, Jerry, who was our minister to senior adults, passed away last year, and Susie felt led to start a group for widows that is strictly social in nature. While groups centered around grief recovery and counseling are plentiful, she discovered a lot of widows simply wanted someone to hang out with, or go to the movies with, so she started this group known as "Women of Worth." 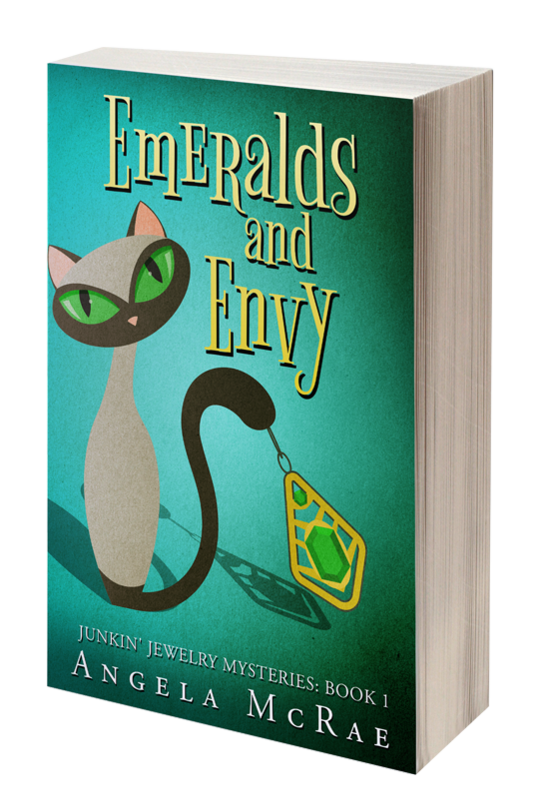 The name is one I love because it focuses on where these women are in life now. So when Susie asked if I would organize a tea for the WOW group, I said sure, and the tea was set for this past Monday, March 6. As you can see, the members of the Glory Class (Susie's and my Sunday School class) provided no small amount of food! 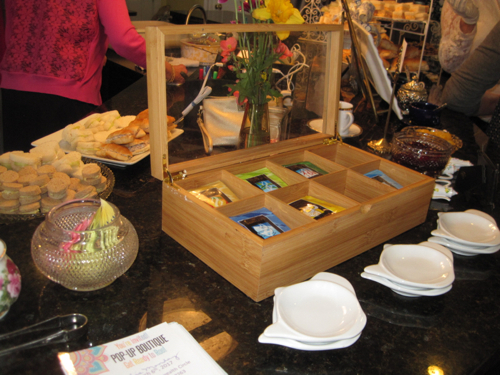 Our tea sandwiches were pimiento cheese, chicken salad on mini croissants, cucumber, and egg-olive spread. We also had scones, chocolate cake, lemon bars, blueberry bites, and my own Brown Sugar Shortbread, which I naturally failed to get a picture of. 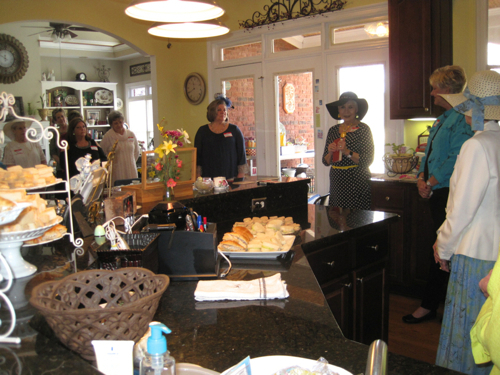 The tea was held at the absolutely gorgeous home of Judi, a member of my church I actually hadn't met yet but who apparently likes to host friends like the WOW group. Like a lot of churches these days, First Baptist has two services on Sunday, and since Alex and I go to early church, I'm forever meeting members I didn't know I go to church with. I used to think I could never enjoy a large church, but I've learned that when we bond with our small groups, like Sunday School classes and Bible study groups, we still get to experience the small-church feel. I was so grateful to be able to call on my fellow class members to help with this tea! Gerry, above at left, was there as a member of the WOW group. She is also in my Bible study class, and when she arrived early, she offered to help assemble cucumber sandwiches. (You'll swear I'm making this up, but she is 82! You'd never know it, would you?) At right you'll see myself and fellow SS class member Georgia, a worker bee if ever there was one, and Judi, our hostess for the day. I wish I'd had more time to explore that lovely home of hers, but we were busy, busy, busy! Here's our wonderful Susie sharing a brief devotional at the start of the tea. I prepared three different kinds of tea, and many women wanted to sample them all. 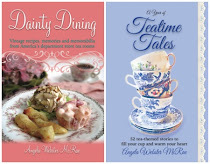 I served the new Twinings Earl Grey Lavender, Celestial Seasonings' Candy Cane Lane Green Tea, and Tin Roof Teas' Tiramisu Mascarpone Rooibos, all three of which had requests for seconds. Helpfully, Georgia brought along her tea chest for sharing, and I'm pretty sure I saw some women sampling teas from it as well. 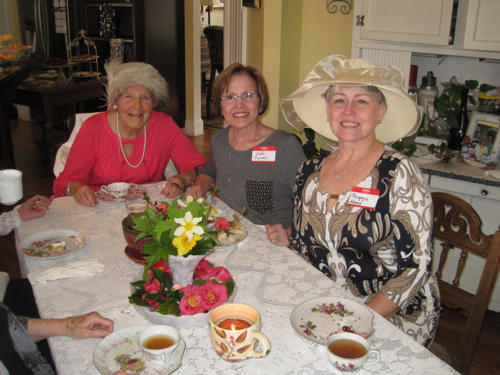 Here are Susie, Georgia, and some of the other ladies enjoying tea in the living room of the "tearoom." 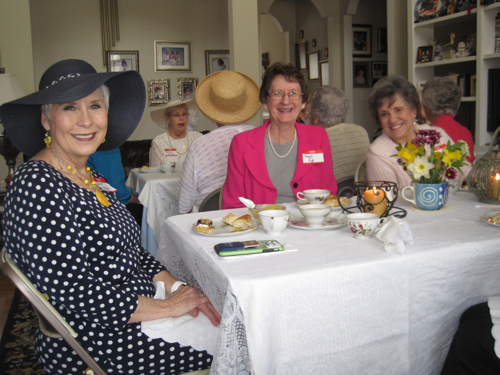 My friend Patty, at left, looked so cute in her ladylike ensemble! 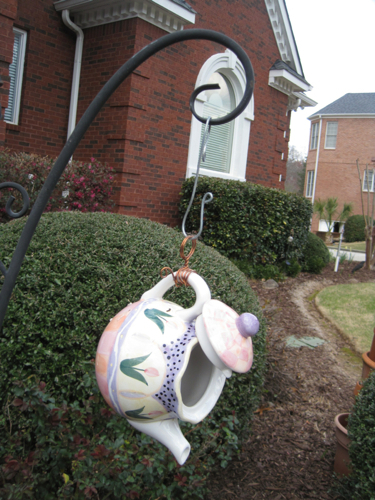 Judi had lots of tea touches on display throughout her home, and I wanted to share the first one I noticed when I arrived, this cute teapot birdfeeder. I knew it was a sign that a fun day was ahead, and it absolutely was. I'm pleased I was able to be a part of such a useful new ministry, and I'm so glad I have church friends I can count on to bake, cook, and serve when called upon to help! A baby shower for a dear friend!